February 1, 2017 (La Mesa) - Sharp Grossmont Hospital has been named one of America’s Best Hospitals for Heart Care by the Women’s Choice Award®, a nationwide referral source that identifies the country’s best health care institutions based on clinical criteria and surveys. The award signifies that Sharp Grossmont Hospital is in the top 9 percent of 4,789 U.S. hospitals offering heart care services. February 14, 2016 (San Diego) -- It is the leading cause of death in the nation, but not in San Diego. Stroke kills over 1,000 San Diegans every year. May 8, 2014 (San Diego) - The good news is that the number of stroke deaths has decreased by more than 30 percent in the past decade. Local health officials aim to keep driving the number of deaths down and make San Diego a stroke-free zone by raising awareness about the warning signs and symptoms of stroke. February 7, 2014 (San Diego’s East County)--It’s Valentine month and February is also American Heart Month. Cardiovascular Disease is the leading cause of death in the United States. Now is a good time to take preventive steps and beat it! November 17, 2013 (San Diego's East County) -- Many more American may soon be prescribed statin drugs to prevent heart disease. That’s due to new guidelines just released by the American Heart Association and the American College of Cardiology for use of cholesterol lowering drugs – specifically statins. How do you keep firefighters and paramedics out of your home? February 25, 2013 (San Diego’s East County) -- No joke here… You can start by taking care of yourself and eating right! That’s right says Fire Chief Sam DiGiovanna, your local firefighters and paramedics respond to thousands of medical related calls each year (approx 75% are medical related calls). This Friday is March 1st and March is National Nutrition Month! 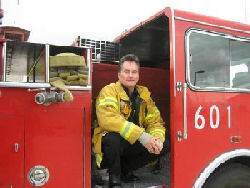 January 16, 2013 (Spring Valley) – On January 19 the community is invited to a special fundraiser at Steele Canyon High School, 12440 Campo Road, Spring Valley from 10 a.m. to 2 p.m. to benefit the family of Don Mott. Mott is recovering from a seven hour open-heart surgery after suffering three heart attacks in the month of December. February 12, 2012 (San Diego)--A healthy heart is the best gift on Valentine’s Day—and all year. On Feb. 10, County officials and community partners kicked off the “Love Your Heart” campaign to help residents take charge of their own health by offering free blood pressure screenings. Chairman Ron Roberts launches the “Love Your Heart” campaign. He is joined by Donald Turko from County Dept. of Human Resources, Minh Nguyen from US HealthWorks, Dr. Nick Yphantides from HHSA, Mary Ann Barnes from Kaiser and Nick Macchione, HHSA Director. July 15, 2009 (El Cajon)--The Grossmont College Foundation, a fund-raising organization that benefits Grossmont College students and educational programs, has announced that it has received a $30,000 grant from Abbott Vascular, one of the world’s leading vascular care businesses. The grant will benefit Grossmont students who are enrolled in the college’s cardio-vascular technology (CVT) program.